CM: The art of Eozen Agopian deals with the multiple legibility of representation. She uses addition and subtraction in an aim to discover what is happneing behind the appearances of multidimensional reality. Herewith Eozen took a sketch of a face and placed it in a complex field of reading. The Looming Face comprises of two superposed surfaces. 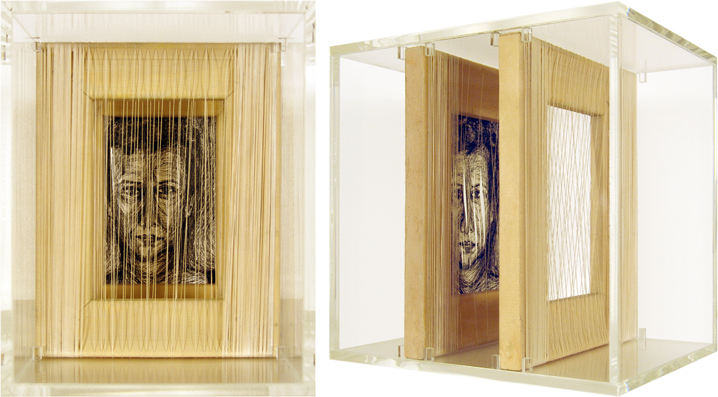 The first is a frame woven by threads, which create vertical lines with distance between them, so that they may allow the view of the face that looms behind. It operates as a filter that presents the face in a space continuum. On the second surface the frame supports the drawing of the face, which is slashed vertically. The slashes on the face open up the drawn surface so that it may be penetrated by light. These slashes also exist in a dialog with the woven threads. The light performs a vital role by interacting with the drawing and becoming part of it. Eozen considers the quality of handiwork to be an important aspect in her art. She likes thread as a natual line in space with the ability to join or to mend. The weaving of thread references handiwork, which has healing qualities and leads to a condition of balance.